So a snap General Election it is then. The stars are surely aligned for substantial Conservative gains. They appear to be polling double the vote share of the Labour party at the moment. That would deliver a thumping majority. The Commentariat has already expended plenty of effort over the last 36 hours doing its thing – focusing on the possible triggers for May’s U-turn on an early election. Maybe the rationalisation she offered stands up: it’s all about silencing dissent and easing the passage of her version of Brexit through Parliament. Maybe she has simply lost patience with having to engage in actual politics. She believes a substantial majority will deliver her an iron grip on policy direction, with no need to listen to or accommodate anyone else. The second statement here seems pretty fatuous. I don’t suppose for one minute the other parties to the Brexit negotiations will be swayed by the size of the popular vote in the UK. Yet, it might well make May even more unyielding than she is already. The words Theresa May and ‘delicate negotiations’ don’t sit easily in the same sentence at the best of times. It is perhaps apt that in making this statement she manages to sound disturbingly like a comic book supervillain. The third statement is intriguing, inasmuch as it isn’t at all clear there is a long-term plan or that May has any idea what the right long-term decision is for a more secure future. But maybe that’s just me. While the explanation might well lie in frustration at having to accommodate diverse views and attend to opposition, the other thing that has materially changed in the very recent past is that the CPS has indicated it is gearing up to prosecute at least a couple of dozen Conservative MPs for expenses irregularities in relation to the 2015 General Election. So May’s majority might shortly have evaporated entirely. A cynic would suggest that this might, at the very least, have focused the mind on the wisdom of a change of tack. You couldn’t rule it out. The way in which the Conservatives will play this election campaign seems relatively straightforward. “Will of the people” “Deliver Brexit” “Enemies of the State” “Friend of Terrorists” “Country uniting behind Brexit” “griping out-of-touch Metropolitan Elite” and so on and so forth. May’s speech had a dig at just about everyone who might raise an objection to what she is proposed. 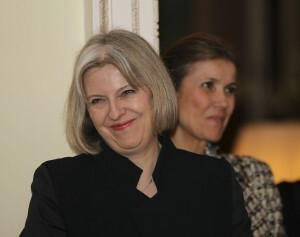 The fact that she was equivocal in her response to the Daily Mail’s disgraceful “Crush the Saboteurs” headline – a line that has not achieving this sort of public profile since Lenin proposed it was time to get some purging done – suggests that those hoping for a civilised battle of ideas over the next seven weeks are likely to be disappointed. One of the most intrigung elements of the campaign will be how the Liberal Democrats fare. The party responded positively to the idea of a General Election. If May wants to make it a referendum on Brexit – to secure a mandate for a hard Brexit – then the Liberal Democrats will see it as possibly the last chance to stop this dastardly plan. The party will campaign as the only unambiguously anti-Brexit party. Membership grew substantially yesterday in response to the announcement of the election. Tim Farron was quick out of the blocks in making a statement on point, although it was rather less clear than it might have been as to whether the party’s position was going to be anti- any sort of Brexit or anti-hard Brexit. The anti-Brexit platform gives the Liberal Democrats a USP. But I have been thinking for a while that maybe that’s a mixed blessing. As the party “of the 48%” that is actually doing some opposing it has attracted a lot of new members from among disillusioned Labour supporters and pro-remain moderate Conservatives. It feels to me like there are two, interrelated, issues here. The first is that if Liberal Democrats are viewed as nothing more than an anti-Brexit party then they have the inverse UKIP problem. If, perchance, the battle to remain is lost then those members will drift aware. The second is the extent to which those joining from other parties are in sympathy with – even aware of – the broader Liberal Democrat policy platform. This issue returned to me today when I read a post at Progress Online by Alex Warnakulasuriya, who had resigned from the Liberal Democrats and rejoined Labour when the General Election was announced. I didn’t find much of the rationale for this decision convincing, but there was something in the thrust of the argument that to confront the Tories you need a full-spectrum opposition, not a one-trick pony. The Liberal Democrats aren’t a one-trick pony – the party’s raison d’etre is not simply to oppose Brexit. It has worked-out policy positions across key policy areas. But it is not beyond the realms of possibility that all some people know of the substance of the party is that it is anti-Brexit. The party also has the challenge of moving on from the Coalition era. There has been relatively little time for it to re-establish independent policy positions that differentiate it from the Coalition record, particularly as its public profile has dropped as a result of its depleted numbers in Parliament. This election is likely to be fought as a referendum on Brexit, with a supplementary judgement on Jeremy Corbyn. That is very likely to crush the Labour party. The Liberal Democrats will make gains as a consequence. I guess I am looking ahead to what happens then. This election could be an extinction event for the Labour party. The pressing question then arises: where is the opposition to Mayism going to come from? There is a strong argument that social liberalism – understood in all its richness, rather than the desiccated version that inhabits the media bubble – is more in tune with contemporary society than a Labour movement that seemingly lacks a sense of purpose in a world after organised labour. So, if they can get the broader message out, the Liberal Democrats have a genuine chance to move to occupy the vacant space where the opposition should be. Every vote will make the party stronger. If, that is, it’s in the right place, given FPTP. And with a rampaging vote-strengthened May on the loose, British politics is surely going to need effective opposition now more than ever. 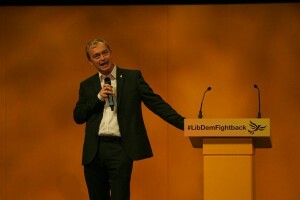 Image: Tim Farron: Liberal Democrats via flickr.com under Creative Commons. I find it very difficult to understand why so many people are expecting significant Lib Dem gains. It reminds me of the widespread expectation before the last election that the party would retain most of its MPs despite having a poll rating in single figures. Uniform swing has actually been a pretty good indicator of Lib Dem seat numbers in the last few elections. Based on current polls it shows only a small change from the present number. The problem is that the polls imply a LD to Con swing of 3-4%. That needs to change if the Lib Dems are to win many more seats – or probably even to get into double figures, because there are only 3 Labour-held targets vulnerable to a swing of under 6% to the Lib Dems. Thanks for your comment Chris. I was careful to steer around the question of numbers for the sort of reason you identify. I wouldn’t be at all surprised if the Lib Dems picked up a lot of votes but relatively few seats, as a consequence of FPTP. That would be disappointing, but not surprising. Well, if the Lib Dems could pick up a lot of votes, I don’t see any reason why they shouldn’t regain a lot of the seats they lost two years ago. I just don’t see any indication in the polls at the moment of anything but a modest (3-4 point) recovery in the party’s national vote share. Maybe the campaign will change things, but of course another problem is that, given its performance in 2015, the party really can’t expect the kind of media exposure that they’ve traditionally had in general elections. One factor that we are yet to feel the effects of is the Tory attack lines on Corbyn and Mcdonnell. It appears Lynton Crosby is back in town to lend a hand. So it’s going to get dirty. There was a Sky News blogpost a few hours ago reporting on some focus groups in which a lot of Lab supporters were unaware of the history (support for IRA bombing etc). It will be interesting to see what effect it has on voting intentions when the skeletons are brought out of the closet and paraded. I’ve always thought that all the baggage he carries was one of Corbyn’s biggest weaknesses (even when set alongside monumental incompetence). Will it shift votes from Labour? I’d be surprised if it didn’t. Will any of them end up with the Lib Dems? Hard to say. Depends in part on whether/how LDs get to make the case, I guess. We’re no doubt about to find out.